Bus from Singapore to Seremban is the fastest and most convenient transport. Passengers prefer bus to flight and train because of these reasons. First, there is no flight service between Singapore and Seremban. Second, non-direct train service and older generation of train from Singapore to Seremban are the reasons for passengers taking bus from Singapore to Seremban. Eltabina, The One Travel, Golden Coach, Seasons Express and Grassland are bus companies offering bus from Singapore to Seremban. Their combined trip have 18 departures daily, starting as early as 8:00 am and with last departure at 11:59 pm. Among these operators, Seasons Express is the largest operator in this route with total 7 daily departures. All of the operators operate this route with VIP coach. The air conditioning VIP coach is equipped with seat arrangement of 1 seat on the left and 2 seats on the right. The spacious seat layout ensures passengers having comfortable journey from Singapore to Seremban. The bus fare from Singapore to Seremban is the region of SGD 18.00 - SGD 30.00 depending on travelling day. Bus fare is lower during weekday and it goes higher during weekend. The trip duration from Singapore to Seremban takes about 5 hours depending on traffic condition. The coach has a stopover in the mid of journey for passengersâ€™ washroom break. 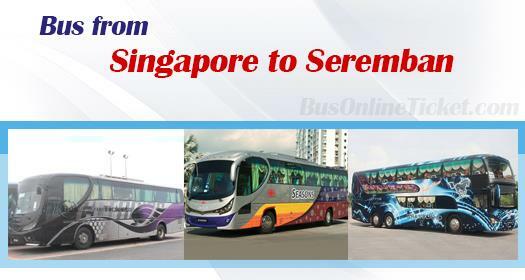 There are few boarding points in Singapore for bus service to Seremban. Passengers have the choices to select the boarding point at their convenience. BusOnlineTicket.com is the reliable and user-friendly online booking portal. BusOnlineTicket.com allows you to purchase bus ticket online in anytime and anywhere so long you can connect to internet.